All About The Blood Phlebotomy Resources is an on-site, employer-sponsored resource ready to take phlebotomists, laboratory technicians and assistants, and other healthcare and research personnel step-by-step through phlebotomy and specimen processing theory and practice, and national phlebotomy certification preparation. Developed to meet the unique training needs within the healthcare and research industries, All About The Blood provides customized, comprehensive phlebotomy training for both individuals and groups. Trainees are instructed using the CLSI (Clinical Laboratory Standards Institute) recommended standards for venipuncture. Additionally, instruction includes, but is not limited to safety, infection control, HIPAA, legal and regulatory issues, pre-analytic errors and variables, patient relations and customer service, human anatomy and physiology, the circulatory system, and the composition of blood. For a list and description of resources offered by All About The Blood, click here. LaVerne Farrar, B.S., PBT(ASCP) is a certified and insured phlebotomist, and an active member of the American Society of Clinical Pathologists. LaVerne is the phlebotomy educator and former phlebotomy supervisor for the Johns Hopkins Medical Laboratories in Baltimore, Maryland. 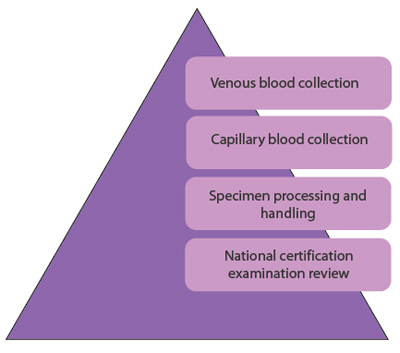 With more than 20 years of clinical laboratory supervisory, educational, and phlebotomy experience, LaVerne has trained countless numbers of phlebotomists, doctors, medical students, nurses, and research personnel in the theory and practice of specimen collection of patients and research study participants through the lifespan--from newborn through geriatric. LaVerne is a proven leader and trusted phlebotomy educator who is dedicated to the education, professional development, recognition, and certification of all who have phlebotomy responsibilities.